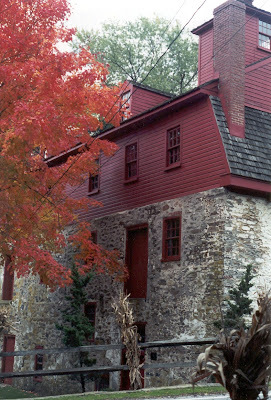 The sights, sounds, and smells of the 18th-century will come to life at Newlin Grist Mill’s Fall Harvest Festival. Smell the fire as open-hearth cooks prepare period meals, hear the pounding of anvils by blacksmiths, have your silhouette made by a traveling silhouette artist. Enjoy the sounds of period harp and mandolin music and listen to a cappella choir performances by the Colonial Revelers (performances at 11am and 1pm). This year over 20 demonstrators will ply colonial crafts and trades including spinning, weaving, laundering, iron making, potash making, and even brick making in the brick yard! We hope you will get your feet dirty and help us tread clay in the pit or help us make hand-made brick before the brick firing.) This year honeybees and historic bee skeps will also be displayed. Festival favorites such as colonial dancing, mill demonstrations, colonial toys and games, pumpkin painting and hay rides (weather permitting) will also help round out the activities for this day of family fun.